Hallo ihr Lieben! Herzlich willkommen im Wochenende. Ich hoffe ihr genießt die freie Zeit in vollen Zügen. Ich hatte euch ja vor einigen Tagen ein Video zu einer meiner "Bird Crazy"-Karten versprochen, und heute ist es endlich soweit. Hi Crafters! Welcome to another weekend. I hope you're enjoying it to the full. A few days ago I've promised you a video to one of my "Bird Crazy" cards, and - yeah - today's the day. Im folgenden Filmchen zeige ich euch, wie ich den armen, kaffeelosen Freund auf dieser Karte mit Inktense-Stiften auf Kraft Cardstock koloriert habe. In the following film I'm showing you how I've colored the poor coffeeless guy on this card with Inktense pencils on kraft cardstock. Nach dem Kolorieren habe ich die Szene nur noch schnell mit der größten Stanzform aus den "Stitched Rectangles" von Simon Says Stamp durch die Big Shot gejagt und auf einem cremefarbenen Kartenrohling aufgeklebt. Fertig. To finish off my card after coloring I only quickly cranked the scene through my Big Shot using the largest of Simon Says Stamp's "Stitched Rectangles" and adhered it to a cream colored cardstock. Done. 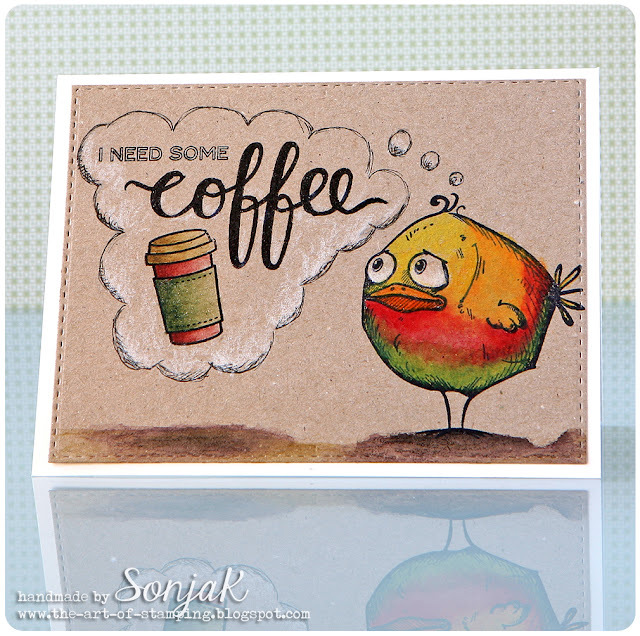 Stempel: Stampers Anonymous "Bird Crazy", Lawn Fawn "Love You A Latte", Create A Smile Stamps "Coffee First"
Stanze: Simon Says Stamp "Stitched Rectangles"
That bird really is a need of a coffee! Will watch your video later in the evening. Great card and a very informative video! Thanks for taking the time to explain your process, Sonja. Poor little bird! I love your treatment of the crazy bird with the sentiment! Too cute! Your coloring is awesome!! 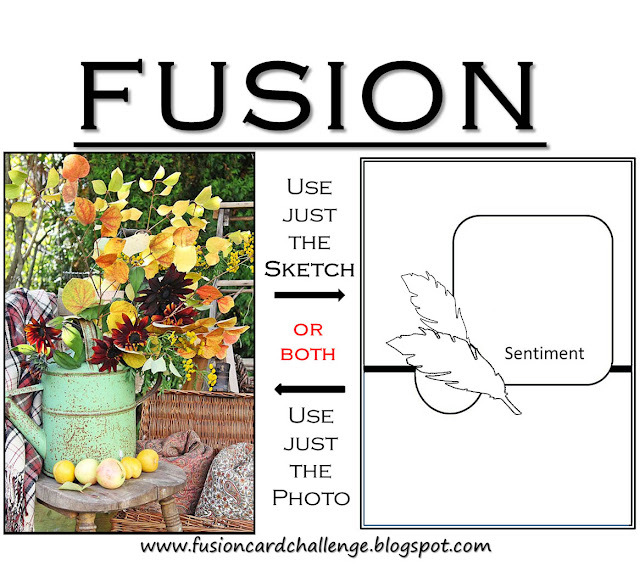 Thank you for playing along with the Fusion Card Challenge!